The pond is Dave's preserve. He dug it, he filled it, and he maintains it. Every Septemeber he clears it out. 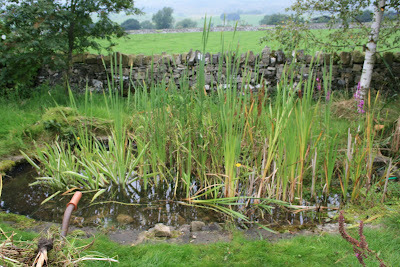 But this summer the pond has been sick for several months. It has been leaking. Only now has Dave found the leak and fixed it. The leak was caused by two holes which (according to him) are the precise size and distance apart as two prongs of a garden fork. I am the chief suspect, but I deny going near the pond with the fork. My theory is that a local heron has swooped on a frog in the pond and missed, and then pecked again. 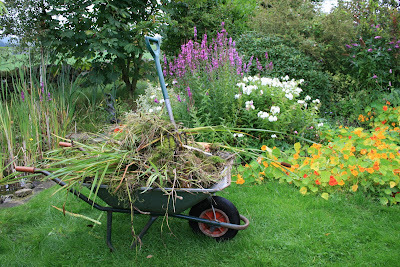 Here is the wheelbarrow containing the detritus from the pond. Dave was using the fork. As I said, he is the only one who goes near the pond with a fork. I rest my case.